A total of 7 sensors that control the temperature. To determine the exact temperatures in each section, precise K-type thermocouples with accuracy +/- 1C in a closed loop were used. Automatically retractable and retractable optical positioning system Split Vision 1080p 5Mpix Optical system moves X and Y axes. In addition, each of the positions of the X, Y optical system that is important for the automatic process of pouring out and distributing chips is software, i.e. editable. 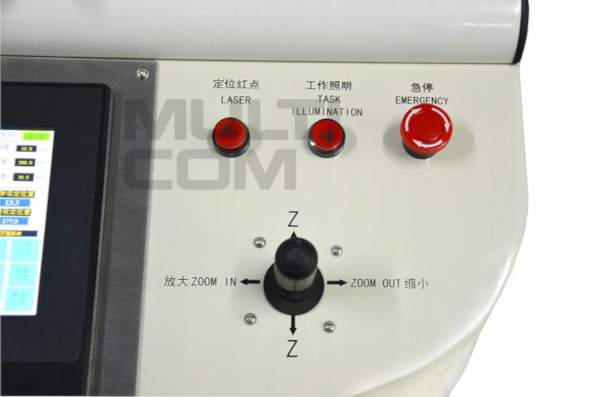 Additionally, for critical moments of soldering processes, it is also possible to set and save the position of the upper head, ie position Z. 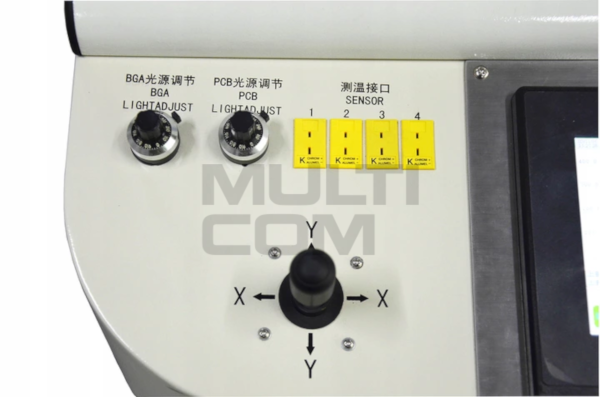 This BGA station model has fully configurable positions of the main moving components in the X, Y, Z axis so that they can be stored in the device memory making the soldering process still more more automated. The fan speed of the upper hot air heater is programmable in percentage for each of 100 profiles. very efficient transverse fan automatically cooling PCB boards after desoldering and soldering. This prevents deformation of the PCB and protects the reballing effect. after each desoldering / soldering process an alarm is generated. in the event of high uncontrolled temperatures or damage to one of the fans, the programmed protection system can trigger an alarm and disconnect the heating zones. is equipped with 6 support points for the plate on each side. the possibility of exporting and importing profiles via the built-in USB port as well as exporting in the form of a csv file and bmp full data of the completed soldering process. 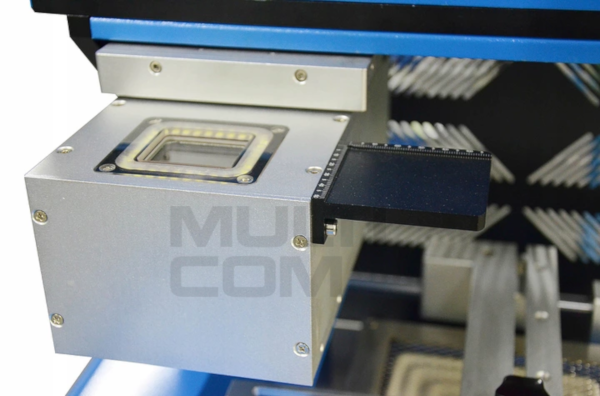 The main PCB holder has been equipped with V-gouging which ensures quick and stable plate assembly and a large adjustment range. To direct the hot air and protect neighboring elements, magnetic nozzles were designed in the upper and lower part of the station. Nozzles are mounted very simply with one hand. They can be set and rotated at any angle. - shows all station operation parameters in real time, including graphical visualization of the heating process status and the set and temperature reached in the graph for each of the three heating zones and each of the 4 external temperature sensors. 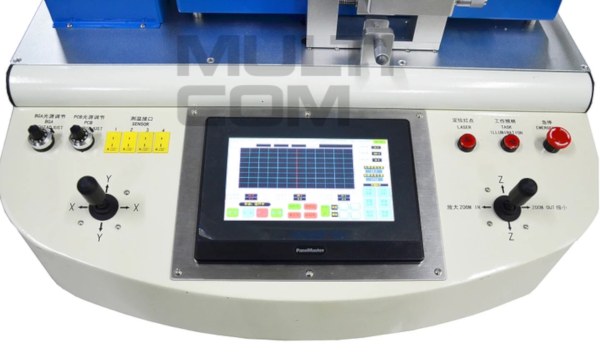 - thanks to the precise control of the increment and temperature values at each stage of the process, the highest standards and IPC standards are precisely defined, which precisely define the individual soldering phases of the systems, ie PREBAKE, PREHEAT, SOAK, REFLOW, COOLING. 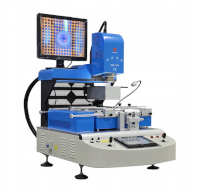 In the case of irregularly shaped slabs, the station is equipped with 11 PCB holders which, in addition to the V-grooves, also have pins that are ideally suited for placing in the mounting holes of the boards. 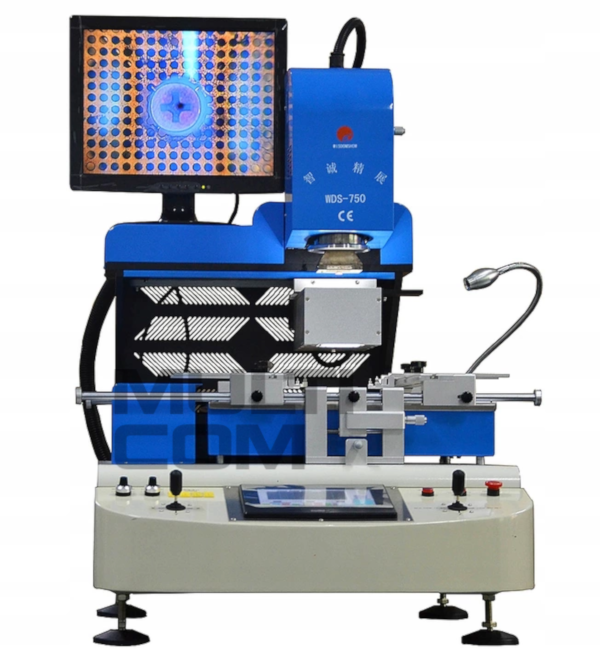 In order to eliminate the deflection of the plate during the soldering process, the holder has additionally two rows of brackets and the possibility of supporting directly under the brazed system (screw with adjustable height in the lower nozzle of the hotair). - 5Mpix camera with magnification and 15 "1080p HD LCD monitor. 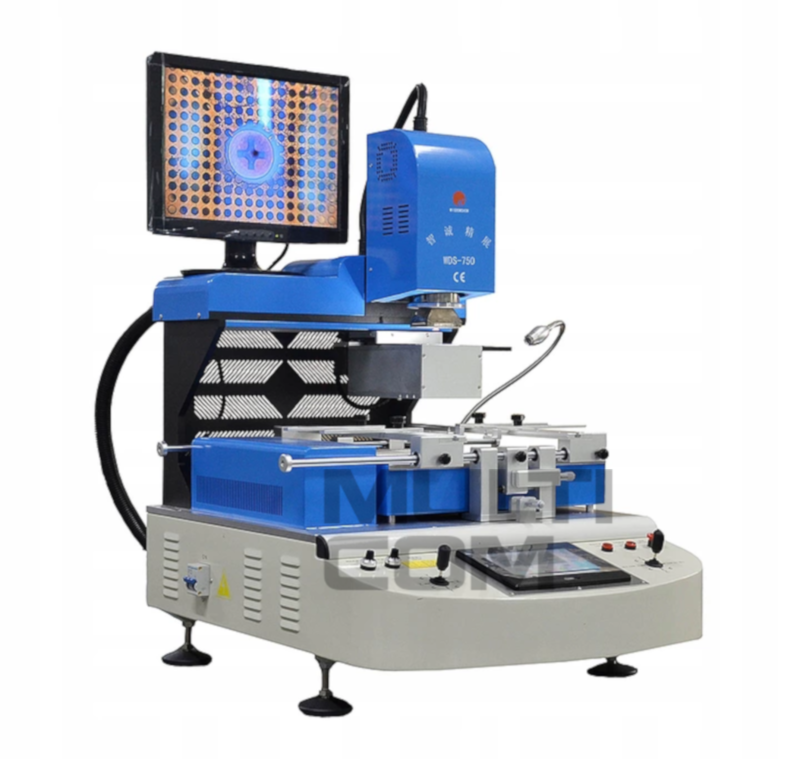 - additionally, the station enables automatic lifting, picking up and lowering of soldered elements on the laminate. - external USB port for updating software, exporting and importing data and profiles. - The station has a declaration of conformity and CE marking. - overcurrent protection: fuse with C32 characteristic. - WDS-750 soldering station with 6800W power. - Nozzles of the upper heater (41x41mm, 36x36mm, 28x28mm, 18x18mm). - Nozzles of the lower heater hotair (35x35mm, 50x50mm). - Spare silicone tips for the vacuum gripper. - Thin K type thermocouple DIA = 0.127mm - 4 pcs. - Six handles for non-standard PCBs + mounting screws. 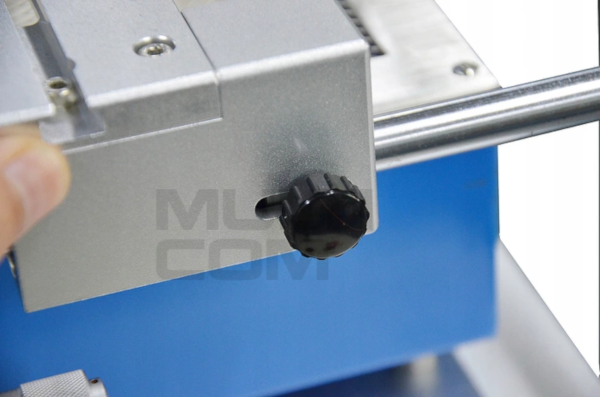 - Additional 2 lateral holders for supporting larger PCBs. - HD 15 "HD LCD monitor.